I don’t really know what a collection is, and I can’t find any mention of this message in any documentation. I do have folders in KeePass2; are they somehow being interpreted as separate collections? What is the problem here? Did you see this on the main page of Bitwarden? Is this for personal use only, or do you need to share your credentials? If personal use only, I’d suggest setting up a personal account. Personal accounts can hold an unlimited amount of folders. 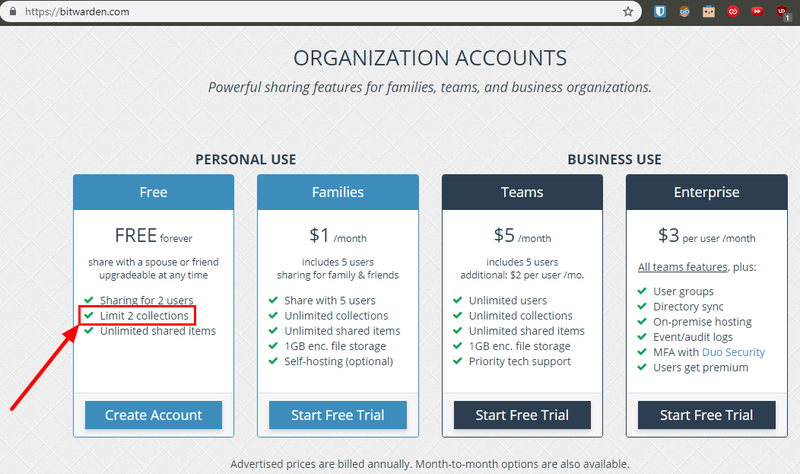 Otherwise you’ll have to either get the subscription for an organisation account that suits your needs (as per @K0media’s screenshot), or move your passwords out of their folders before exporting. Collections are (simply speaking) the equivalent of the personal accounts’ folders. See https://help.bitwarden.com/article/folders/ for an explanation of the differences between folders and collections. Personally I found the differences between personal accounts, organisation accounts, folders and collections to be a bit confusing as a new user, since it works differently to any other password manager I’ve used. Ah, so Bitwarden is indeed seeing KeePass’s folders as collections. That’s pretty silly. Is there any way around that on import? I’ve got a fair number of passwords saved, and it’d be tedious to move them all out to the top level. I did, but that doesn’t address my question at all. it’d be tedious to move them all out to the top level. Best I can suggest is to start a trial for an organisation account with unlimited collections and then import. I’m unsure what happens with your collections if you then end the trial. Having the option to ignore folders during import is a decent request, though. Turns out I was indeed trying to import my KeePass2 vault into an organization, but I wasn’t aware of that because once you’re on the import page, there’s no indication of what sort of thing (personal/organization) you’re importing into. Could use some better UI. Glad that you managed to sort it out in the end. I ran into the same issue when importing from Lastpass with the free account. I just upgraded to Premium and it let me import all of the content from Lastpass. Interestingly enough though, once the import completed successfully, it didn’t show the imported records as collections, but as folders. Still trying to understand what the differences are between folders and collections.